Have a Fall Release? Looking for some excellent means of promo? Then you have come to the right spot!! We are looking for authors and bloggers to join in on one of the soon to be biggest hops of the year!! And with this list of prizes, I think we will have no problem hitting that goal! The PRIZE PACKAGE is already in place, so no donations are needed unless you would like to be featured in the release spotlight catalog that will appear on everyone's blog as part of the hop post. If you would like to participate, we just need 6 e-copies of one of your books (choice is yours) and information on your fabulous Fall release. Books releasing September 1 – December 31 are eligible. Interested, but new to blogging? Not sure how to sign up? Not sure what is expected or how to set up the post? No problem!! 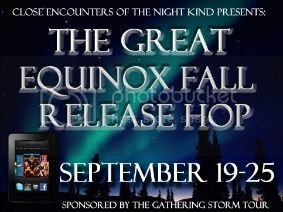 Just e-mail me mailto:viajeradelmar@aol.com Subject Line: The Great Equinox Fall Release Hop and I will get you the help you need! (Three) Second Prizes: One e-book from every participating author. Individual blogs may also be offering additional site-specific giveaways. A. FOR THE FIRST 24 hours, Hop Post must be TOP POST.. Any blog that does not display the hop by 5:00 a.m. on September 19th, will be removed. Likewise, early removal is not permitted. B. You need to have a giveaway. It can be anything book or blogger related. You want people to stop by your blog and hang out! Hey Nikki, Are you sending out the list code for this?